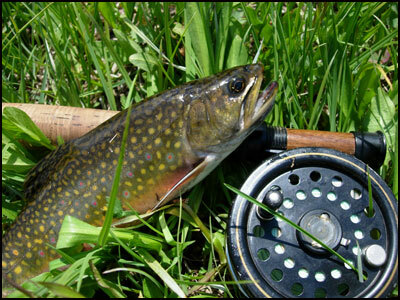 For the ultimate fishing experience, come journey with us into the spectacular high country of the Rocky Mountains, where some of Colorado’s finest trout waters await in the high alpine lakes, stream, and beaver ponds of the West elk Wilderness. Living in these clear, pristine waters are the wild cutthroat, rainbow, German brown, and brook trout native to the high country. Due to its remoteness, this area is accessible by horseback only. Hard to get to, but harder to forget. Here, surrounded by the unmatched beauty of the wilderness, you’ll wet your line in some of the best native trout waters Colorado has to offer. A two hour horse ride will bring us to our Castle Creek Camp, your home away from home for the extent of your trip. Accommodations are first-class, and include roomy guest tents with cots and mattresses, a spacious dining tent, guide quarters, and latrine facility. But, you’re here for the fishing, and there’s an abundance of that. Some of Colorado’s finest spin casting and fly fishing is available in the miles of streams and beaver ponds teeming with native trout just outside your tent flap. The fish are wild and sometimes finicky, but the action can be non-stop as you hunt these trout in the cool, clear waters of the ponds and streams they call home. A short horseback ride deeper into the wilderness will take us to a secluded alpine lake where the size of the brookies and cutthroats are measured by pounds, not by inches. 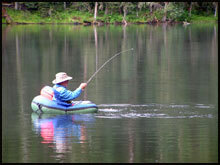 Chest waders and float tubes are furnished for this unforgettable experience. Trips are from two to five days, are fully guided, and include top quality horses, a comfortable camp, delicious home cooked meals, and some great western hospitality. Come stay with us to relax, enjoy some spectacular scenery, and make some new friends, but before you leave camp to fish you’ll want to practice repeating these two simple words, “fish on!” Book your spot on the bank while they’re still available. Great fishing, great accommodations, great food, great horses. Thanks for a great wilderness fishing trip.